This month, Morganne is offering free 15-min postural assessments on Monday mornings at Leyton and Friday and Saturday mornings at Walthamstow – click here for more details. Here she talks about why correct posture is important and how a few small changes can go a long way to reducing some common complaints, along with some easy exercises to help yourself back into better postural alignment. (update Aug 2016: this was available Nov 2014 – we currently aren’t offering this service). “Good posture” is when we hold our body in a position that requires the least amount of effort from our muscles whilst keeping the joints in their most stable/optimal position. There are a lot of theoretical, but generally accepted, reasons to maintain good posture, such as to decrease abnormal wear and tear on joints and to decrease stress on ligaments with the aim to reduce the potential for injury. Unfortunately, most of what we do on a day to day basis promotes poor posture. Poor posture may be a result of varying factors but a big contributing factor is the seated position that our bodies maintain for a long period of time. Over time, this can lead to short and/or tight muscles and lengthened/overworked muscles, which may inhibit ease of movement or increase the likelihood of pain. 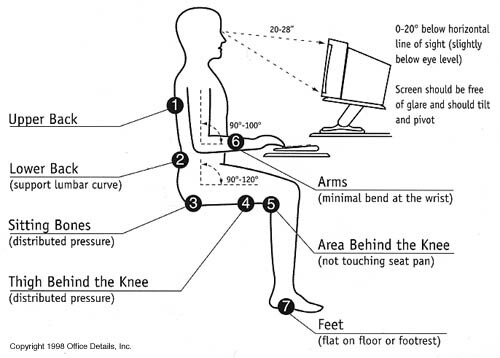 If you have the option at work, we strongly recommend you have a personalised ergonomics assessment of your work station. In the meantime, here are a few easy, quick posture fixes you can incorporate in your day to day seated posture. Try to do only one or two at a time, and once that becomes a habit add another. Try to slightly contract your abdominal muscles when seated or standing to support your lower back – about 10% effort is sufficient. Have knees at or below hip height to minimise shortening of hip flexors. Try to keep your ankles in front of the knees. Relax your shoulders and have forearms parallel to the floor. Gently pull your shoulder blades towards each other and down your back (again, approximately 10% effort). Tuck your chin slightly so it’s parallel to the floor (but not overly so) and lengthen the back of your neck. In order to combat bad posture we need to be aware of the positions we’re putting our bodies in and try to assess and adjust this to bring us back into alignment. Two common imbalances that can develop from prolonged sitting include lengthened/weak upper middle back creating tight chest muscles/forward rounded shoulders, and tight hip flexors/weak underactive glute muscles. Tight chest muscles/weak upper back muscles are common aggravators in neck and shoulder pain, and tight hip flexors/weak glutes are a common factor in lower back pain. To help you work on each issue, we’ve paired a strengthening/activation exercise for the underused muscle in the pair and a stretch for the tight/shortened muscle of the pair. We’ve chosen each of these videos because they also include good explanations about the muscles you’re using and why the exercise is important. For each of the videos, please keep in mind the note at the end of this piece. Forward and rounded shoulders, a common consequence of pulling our arms forward during the day, can cause our upper/middle back muscles such as mid and lower trapezius and rhomboids to become elongated, tense, and weak. To remedy this, we want to activate/strengthen the upper back muscles (mid and lower traps), and stretch tight chest muscles (pectorals). This exercise is good because it both stretches and opens the chest, engages the mid and lower traps, and stretches out the back of the neck. We recommend trying to keep your shoulders down while doing the exercise and avoid letting them come up towards your ears to really target the mid and lower traps. This is a good example of the do-anywhere chest stretch we show most of our clients coupled with a useful arm/biceps stretch. For the bent-arm stretch, try raising your arm up so your upper arm is at a 100-140′ angle to your body to also stretch pec minor. In a seated position, the hip flexors are in a shortened position and they can eventually adopt that length, putting strain on the lower back. This can also switch off our glute muscles, leading us to compensate by overusing our lower back muscles. To address this imbalance, you should stretch your hip flexors and re-activate/strengthen the glutes. This video gives a great, step-by-step instruction of how to do this stretch correctly (it is often done incorrectly) and explanation of the location of the anatomy of the muscle you’re stretching. In addition to people who are seated for long periods of time, this is also good for cyclists and runners as those activities can also create tight hip flexors. When seated for long periods of time, as the hip flexors get tight the glutes can switch off. In addition to a simple exercise you can do at your desk, it explains the importance of switching the glutes back on, and why doing ‘glute exercises’ when your glutes are switched off can actually make some problems worse. He recommends six times a day, but we suggest start trying to do it once a day and work your way up. Once you’re sure your glutes are firing properly, you can work on getting up from a chair the way he demonstrates to further strengthen your glutes. We, as therapists, want to be able to help people to reduce the tension and aches that we all get after working for eight hours a day. Massage is a brilliant and effective tool which can be used to ease these aches from muscle misalignment/overuse but if we don’t go to the source of the discomfort we will never beat the problem. That’s why in a massage session in addition to soft tissue work we will also do postural and movement assessments to pinpoint specific areas of muscle tension and/or weakness. We’ll also give you information on ideal posture and home care to help incorporate the changes and prolong the effects of your session. If you’d like more detail on how to help one of the imbalances we mentioned above, we have a free 7-day minicourse to start getting rid of your neck and shoulder pain in just a few minutes a day. Just click the link below to sign up. Click here to sign up and start helping your neck & shoulder pain today. Important note: The videos provided are for information purposes only. You should always consult your doctor or other healthcare professional before attempting any new exercise as it is possible that a given exercise may not be appropriate for your individual situation. Stop doing any stretch or exercise immediately if it causes you any pain and wait until you can consult with a health professional before resuming the exercise.